Before looking at some of the best business cards sample designs, it's important to make note of the elements every business card should include and why each element should be on your card. There are some exceptions to the rules as well – for example, if you work primarily online or remotely, you might not need to include your address on your business cards. What's imporant is that you know why each element should be included on your card, and why. After all, it isn't until you know the rules that you can break the rules. Name – Naturally, you will need to include your name on your card. Even if your business card is for a small business for which you have a separate business name, you should still always include your first and last name on the card so that prospective clients and clients know how to address you when they contact you. 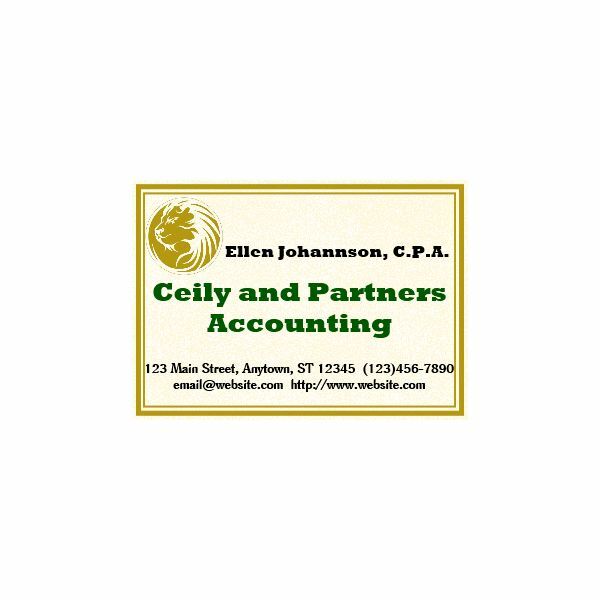 Business Name – Every business card will include your business or company name, should you have one. This should be the focus of the card. If you do not have a separate business name, then you will want to highlight your name on the card. Job Title or Work Description – If you're a consultant, freelancer, or otherwise self-employed, or if your business name is not descriptive of what you do, you will need to be sure to include your job title and/or perhaps a pithy explanation of what it is you do in order to remind your contacts. Phone, Mobile, Fax – You need to at least have either your phone number or your mobile number on your business card. Otherwise, how will people know how to contact you? Provide multiple ways for your prospective clients to contact you, if possible. Address – If you have an office address or if you want to make your mailing address public, then you need to include it on your business card. If you have an Internet presence, you may wish to forgo the address on the business card. However, you should be aware that it is standard. Website – If you have a website for yourself or your company, be sure it's on your business card. It will help clients who wish to check out your company's website and mission statement should they wish to do so. Email – It's important to include your professional email on your business card. Other Contact Information – You may wish to include your Facebook, Twitter, or Linkedin website on your business card as well. Logos on business cards make an important statement. The size of the logo, whether you place the logo in the background or in a corner, and what color you print the logo can all make a difference in the appearance of your cards. When using business logos on your card, you should be sure that any logo you use is in keeping with the impression you want to make about your business. In the lil devil example to the right, while the logo is cute, you would only want to use it for the appropriate business. For example, if your company's name is Lil' Devil's Car Wash, it would be cute, but if you're running a CPA business, it wouldn't make sense. It is vital that you make sure that any logos used on your business card are appropriate to the business you work for or run. Any list of business card sample designs would not be complete without discussion of a financial services business card template. If you use logos on a financial business card, the logo should be kept simple – if you work for a bank, accountancy firm, or financial planning company, then your company will most likely already have a logo you should use on your card. If your company also has specific colors associated with the company, you should use those colors. In this sample business card, I kept the colors used to just three. It's important when you are creating cards as an accountant or as a lawyer that you keep the tone of the card serious. This way, prospective clients will know that you are a professional and that you take your job seriously. 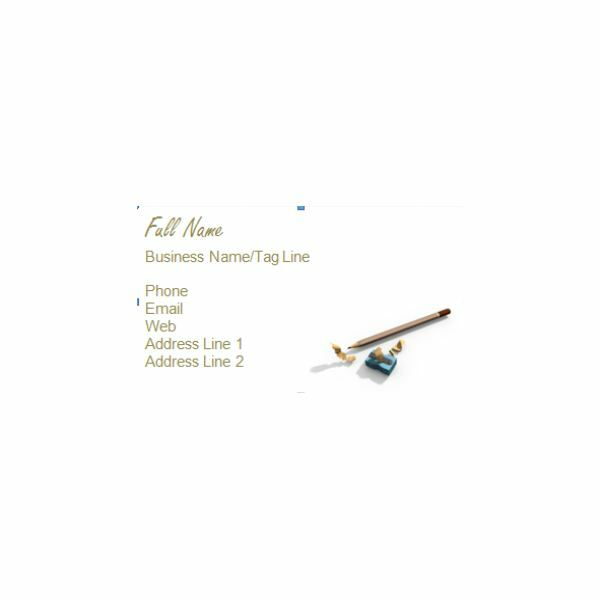 Please continue reading on the next page to find more sample business card designs. When you run a childcare business, an important part of the business plan involves deciding how you will promote the business. 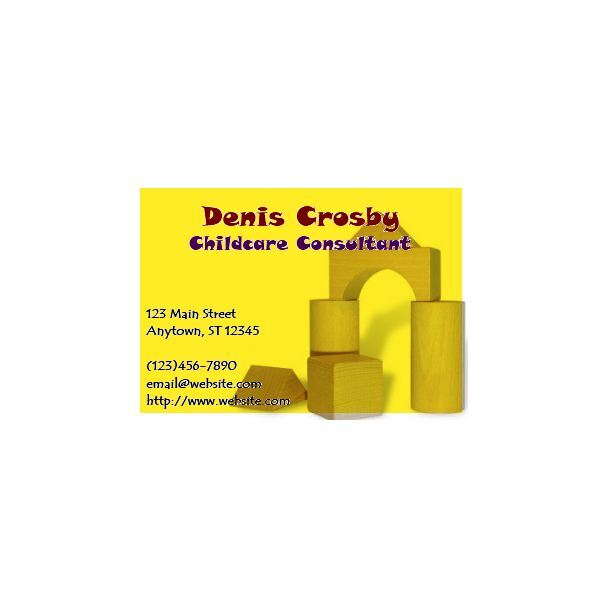 The childcare business cards that have been provided for you in the media gallery can be customized for your use. There are a few options when customizing this template for your own use. You could change this sample business cards design template to have a black and white background, and use a bright color to highlight your contact information, you could change the lettering colors to be black, or you could add multiple layers to create special effects on your business card using desktop publishing software. Creative types typically don't make their business cards snappy enough – especially when it comes to artists and their business cards or designers and their business cards. One of the most fun writers' business cards I've seen featured a typewriter background on Zazzle. One could either enter information as an overlay on the typewriter or could enter the information on the other side of the card. The card to the left features a pencil and sharpener. You could, if you like, modify the clip art to be a paintbrush and a pallet, a computer, or even one of your own works of art. Remember also, that you don't have to stick with artistic themes. You could instead use color or photographs on your card for an element of surprise. With the eco-conscious movement, you may be wondering how to create green business cards – especially because you will be printing them on paper and many may make it into recycling – or even garbage – cans. 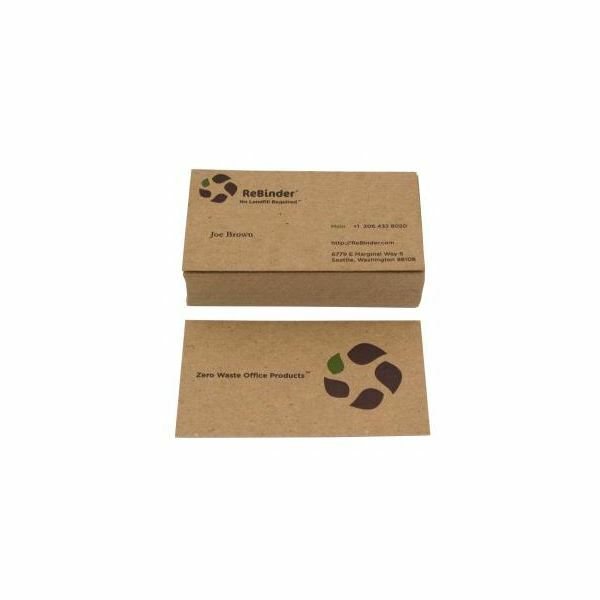 Green business cards can involve recycled paper, earth-friendly inks, and even green sentiments. When designing business cards that are on the recycled paper, it's important to take the color of the card stock into account. Because colors often appear different on different backgrounds, that perfect green color will likely look different on the card you present. Also, when you go to a conference or a networking event, if you are presenting, rather than print out handouts, you can have handouts available for download on your website. Then, when you print your business cards, include the direct web address for the content – or write the web address on the board – and you can use business cards to help save paper. Your business card and your company mission should be a good match, but your personality should also match your business cards. For example, if you're an energetic person, and your cards only have your contact information, you may want to rethink your strategy. While you shouldn't use a bunch of bright colors, you may want to have your name in a bright color – like red – to convey your energy. Finally, the most important part of creating your business cards is ensuring you use quality card stock. You want your card stock to be thick and if you use the pre-perforated type of card stock with a program like Microsoft Word to create business cards, then you will want to be sure when you tear your cards apart that they do not show the perforation marks; especially if you are working in finance, law, or academia.